An interview with Colin Newbold, founder of TLC Online. In this episode of Multi-Site Masters, we talk to Colin Newbold, founder of TLC Online and chief architect of their 360 systems. Colin’s had over 25 years of experience setting up and managing 360 feedback programmes, using such tools to develop and coach leaders to be the best they can be. 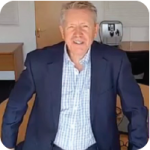 Colin will share the importance of being crystal clear on your reasons for using 360 feedback in your organisation and explain his behavioural change model to help individuals see the need for change and how they can be supported to do so. We’ll discuss why 360 feedback is too often poorly implemented and you’ll be able to hear Colin talk you through a 7 step model that will enable you to execute 360 programmes that make a difference and help leaders to grow.